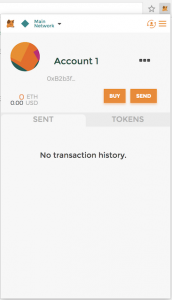 MetaMask wallet, is one of the most popular wallets for Ethereum and ERC20 tokens. 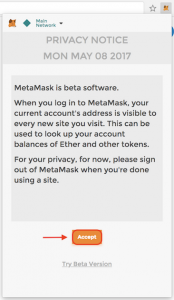 Let’s see how to install MetaMask in different browsers. Follow the link to the extension page. Add MetaMask to your browser by clicking the “Add to Chrome” button to install. 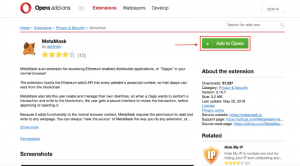 The “Add Extension” prompt asks you to confirm installation of MetaMask. You’ll be asked to Accept the MetaMask Privacy Notice. 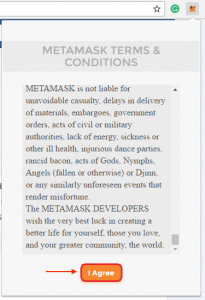 After reading the MetaMask Terms and Conditions, you’ll need to click Agree to continue. 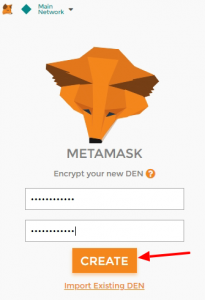 Create a password to prevent other people you share the computer with from accessing your MetaMask account. After entering your password, you will receive your 12 word seed phrase. Anybody who has these 12 words can access your account, even if they don’t have the password you set in the previous step. That means you should never share your seed words with someone you don’t trust. 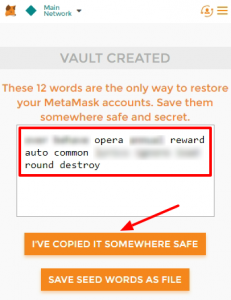 You will also need these 12 words to restore access to your wallet in case you forget your password or something happens to your computer. Once you click the acknowledgement above, you account will be created and you will be directed to your wallet.